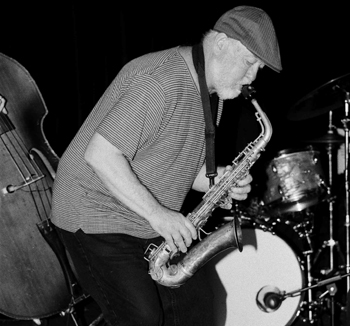 Alto saxophonist Wally Shoup is one of America's great improvisors. This is undisputed in creative music, jazz, and rock circles alike as evidenced in his body of work that includes recordings and performances with Wilco's Nels Cline, Sonic Youth's Thurston Moore, Dennis Rea's influential quartet Stackpole, and his own internationally acclaimed free jazz group the Wally Shoup Trio. His most recent release on LP is a duo performance of free improvisation with drummer and percussionist Paul Kikuchi entitled Aurora Distillations. Having been recorded in an abandoned railroad tunnel in the Cascade Mountains of Washington State, its organic tone and mood are deep and haunting with natural reverb. The music on this record begins slowly with Shoup's saxophone over Kikuchi's malleted toms. The intensity ebbs and flows and Kikuchi's drum movements are tympani-like as Shoup backs off, their empathy evident. There is the sound of rocks clashing in the tunnel and Shoup wails, the duo's free jazz sparring becoming fierce and their spontaneous composition fiery. Kikuchi is powerful, not simply maintaining a consistent rhythm but instead contributing forcefully and then resting, at times with metal objects that have the effect of bells, and at times not at all, while Shoup vocalizes with his horn. The duo effectively uses time and space throughout the course of this album to create tension and release, classical consonance and dissonance, while they also keep the music exciting and engaging, the organic quality of the recording providing a musical depth that couldn't be duplicated in a studio, and they utilize unparalleled musical form. In the following interview that took place in June 2012, Perfect Sound Forever's Jack Gold-Molina talks to Shoup about his inspiration for playing, non-idiomatic improvising, and expanding ideas of rock, psychedelia and free jazz. Perfect Sound Forever: What initially inspired you to start playing music? Wally Shoup: I have been interested in music all of my life as a listener. I grew up listening to music in the South. As music changed in the late sixties and got more abstract and progressive and psychedelic, I became interested in more out forms of music - free jazz, free improvisation. As time went by and I became more immersed in that music, I became inspired to want to play this music. I had started painting and I was expressing myself that way and I realized that the only way that I could get to know some of this music better, and not just perceive it as a listener, was to become a player and to find people who were interested in playing in a fairly free-form way. So I took up saxophone, and I took up other instruments, actually noise-making and a lot of sound-source instruments, in order to create soundscapes and noisescapes with other people. I sensed that the world of free improvisation was going to allow a lot of sound to be made communally and be considered music and I wanted to be part of that. Over time, I realized that I wasn't just interested in bringing in the kitchen sink to play with and I narrowed my focus pretty much down to alto sax. But my initial impetus to play was to create abstract soundscapes with other people. PSF: Was that as a teenager, or in your twenties? WS: Oh no, I was probably in my mid to late twenties. PSF: So you started out playing free improvisation then. WS: Right. I felt to some degree that with the music I had grown up listening to, I was never encouraged to play music. Most of my friends that I grew up with didn't play music but we were all music fans. We all bought records, we would all sit around and listen to music a lot, and it wasn't until the freedom agenda of the late sixties and early seventies that I gave myself permission to jump into the sound pool and start making music myself. That was a very liberating time musically, and it very much liberated me to start getting music that was inside me for years and years, for it to get out. And it is still coming out. PSF: Your first recording, was that the Scree Run Waltz record (1981). What would you say that you were trying to achieve musically with that album? WS: Myself and some of the people I was playing with at the time were influenced by very open-ended, non-idiomatic improvising -- Music Improvisation Company, the British school of free jazz, a group that was important called Alterations - but we were also very influenced by the record Sound by Roscoe Mitchell, by free jazz music from the late sixties that was open-ended as well, experimentations that were happening throughout the late sixties and early seventies in rock, in jazz, in free improvisation. Basically what we were interested in doing was jumping into that fray and then putting our own stamp on it because it seemed pretty wide open that the rules were getting loosened as to what people could do in order to create music that was breaking through boundaries of not only classical or rock but breaking through jazz boundaries. We felt like intuitively, we understood it. We communicated with each other while we were playing through close listening and response that we could shape our own soundscapes depending on what instruments we used, depending on our moods, and depending on how crazy we felt that day. PSF: During that period of the early to mid-1980's, through to your work with Project W in the mid-1990s, how would you say that your music evolved? WS: After I made Scree Run Waltz, I became acquainted with and attracted to the music of Davey Williams and LaDonna Smith who were known collectively at that time as Transmuseq, and who lived in Alabama. I was originally from the South, but when I got into playing I was in Colorado. So I moved to Birmingham, Alabama, basically to immerse myself in their world because I felt like they were advanced musicians in American free improv, which I had gotten very involved with in my own way. I felt like it was time to move back south for a while, so I moved back and for five years, I lived and worked with an improvising community in Birmingham which included Davey and LaDonna, but it also included a number of other really fine musicians and a very strong dance community that worked with musicians in a free improvised way. I kind of gained my footing and my confidence and maturity working in that setting. I moved to Seattle for the first time in the mid eighties and there was a thriving improv community here -- New Art Orchestra, quite a number of things that were happening that were experimental in nature, and not necessarily jazz based either, that included elements of rock and electronic music -- and over time my own playing developed. I found players who were sympathetic to my particular take on improvisation, because improvisation is a pretty big pool and I am coming from blues, jazz, rock and roll. I became more inclined to want to explore the areas of improvisation that had drumming, that had a sense of electricity, that had a fairly intense energy structure, so that is how my playing developed. By the time I was playing with Ed Pias and Brent Arnold with Project W, I felt like I had found my voice and my interests. I was looking for strong, grounded, somewhat studied, sympathetic players to play with. PSF: You had done some traveling during that period also. Can you talk about that a little bit? WS: In the early nineties, I was working with people I had met through Birmingham who were then living in New York. This was the period of the first Knitting Factory. So I made several trips from Seattle to New York to play. By that time I had put out a number of cassettes. There was a community of tapesters who swapped tapes and sent out tapes of improvised music. I also wrote for The Improvisor magazine and reviewed tapes, so I had become somewhat aware of what was going on in the underground improv scene. That was how I formed some connections to play in England, New York, (and) I did some playing in the Bay Area. And then in '96, the Project W CD was put out by the Apraxia label. PSF: You have recorded with Thurston Moore. How did that come about? WS: Thurston is a collector. He had Scree Run Waltz and he knew of the Birminghamians Davey and LaDonna, so he knew of me since the early eighties because he was following certain scenes. The story goes that he came into Wall Of Sound (Records) in the mid nineties and bought one of my cassettes that was there, and he mentioned to (owner) Jeffrey Taylor that he was a Shoup completist. I found out about this and I wrote him, and he wrote me back and invited Project W to open for Sonic Youth when they played at the Moore Theater in May of '98. So we played and we met everybody, and after that it was 'well, I'll come east and we'll do a little bit of touring on the East Coast.' That's where Hurricane Floyd originated, from a short tour we did of the East Coast with Toshi Makihara. 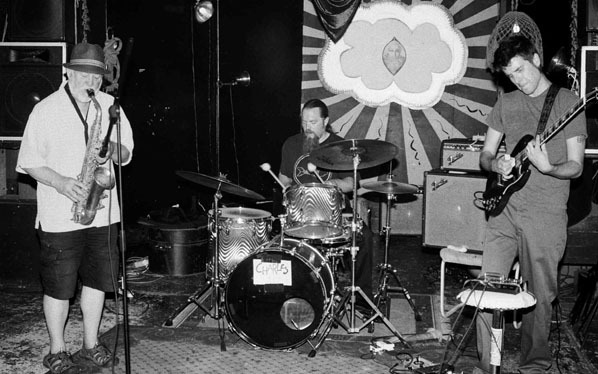 Subsequently, we did some playing with Paul Flaherty and Chris Corsano, I think that was 2002, and a recording came out of a live show at the Tonic, and then a recording came out recently on Japanese Columbia of the same quartet in the studio called The Roadhouse Session Vol. 1. Basically, I have done three recordings with him and I have done some live playing with him over the years, but no more recordings. PSF: The story of Hurricane Floyd is interesting because that was recorded at a chapel in Boston while the actual hurricane was taking place. WS: It was in a big church. I don't know the denomination, but it was the day of Hurricane Floyd. It was still in full force, so it was pretty great that everybody showed up and made it. We drove from Philadelphia. I don't think it was raging outside at the time we played, but all through the day it was iffy as to whether the gig was going to happen. PSF: You have done some organizing as well with the Seattle Improvised Music Festival and, as I understand it, you were also involved with the Gallery 1412. WS: I was a member of the collective at the Gallery 1412 for a few years, but I am not now. PSF: Were you involved with the Seattle Improvised Music Festival? WS: Yeah, I was involved with organizing the early festivals. I worked on the first 18 as an organizer with other people. PSF: How did you come into being an organizer? WS: I had done some organizing in Colorado Springs when I was there, and I organized some stuff in Birmingham. I realized that with this music, if you wanted it to happen, you had to organize it yourself, and I always felt like, to some degree, the responsibility of an improvisor was to the community that you played in as well so that if you were playing and people were organizing gigs for you, it seemed only right to occasionally turn the other cheek, so to speak, and organize for other people, to learn the trials and tribulations of being an organizer, and also to put things together the way you want them put together. Sometimes gigs, especially early improv gigs, weren't necessarily well put together in terms of getting the word out and just making it a good solid enjoyable gig for everybody. Also, in Seattle in the late eighties, there were a bunch of new players coming along and it felt like, why don't we organize a festival to present improvised music in a very concentrated, organized way and see if there is actually an audience for the music if we present it in a professional manner? And it turned out there was, so it became ever more successful every year and it got bigger. We started getting some funding so we could invite some out-of-towners, but basically it was a local festival to present improvisors in various combinations with the intention of showing a lot of variety of what improvised music could be, and also to reward people that we felt like were putting a good deal of time and effort into working at the art of improvisation, and that the general public would benefit and enjoy hearing them play. It is still going today. I stopped doing it after about 17 or 18 (years), but other people have taken up the banner and have kept it going with their own vision of what improvised music is and how it should be presented. I am proud of the work we did. We helped establish it as an entity and I found out that it is lauded as the longest running festival of its kind in North America, which I hope is true and if so, that's great. There is something great about improvised music, and there is something great about Seattle. PSF: I think a lot of people aren't aware of how that comes about. They hear that there is a festival so they attend or they read about it, but they don't necessarily understand how that happens. WS: The current improvised music festival people have a web site where you can go and view the history of how it evolved over time. PSF: You have a new book out, Music As Adventure. Can you talk about that? WS: Sure. I have written about music over the years. I used to write for The Improvisor magazine and I occasionally would write for other publications, some of which were more for the aficionados, some of which weren't. Like, I wrote an article in the mid nineties for The Stranger magazine here in Seattle that was basically just for a music issue and I wrote an article on free jazz/free improvisation, its history, its implications, and I was writing that for a more general audience that probably didn't know that much about it. Over time, I had a number of articles that had been published and Margareta Waterman at Nine Muses Books, who was a poet and a publisher in her own right, knew of my music and my writing and we determined last year that it may be time to collect some of this writing that was out there -- some of it was online, some of it was in publications that were no longer being printed -- and put it all in one form. So we put it together with some of my artwork all in one collection. It's about 17 or 18 articles, the composed writings from the mid-eighties to 2009 (I think is the latest one). It was a short run of copies but it is available online through my web page. That is sort of my ideas, you know what I mean? There's ideas and there's music, and then there's ideas about music. Ideas are always debatable, or arguable, whereas music is what it is. You either like it or you don't. Ideas are ideas. PSF: Can you elaborate on that? WS: Well, there is music, and then there are thoughts about music. The two have been intertwined to me, in a way, because when I started listening to free jazz, I was also reading LeRoi Jones and I was reading people's ideas about what the music was about other than what I was just hearing like what were some of the artistic intentions, the political intentions. I have always been interested in what people think about the music they are making, and then I am also interested in occasionally giving insight as to some of the decision making that goes on while one is playing or the decision making that goes into how to present the music and what makes for a good improvised music performance. So I have ideas about music, and I play music. Playing music comes first, thinking about it comes second, writing about it comes third, but I do that and I wanted to collect some of my thoughts into a book so that people could have some insight into how I approach what I do. PSF: What are some of the projects over the last few years that really stand out for you? WS: I like to think that every project that I have gotten into probably in the past 25 years has been the result of wanting to work with certain people, explore what can happen with the interchange of the way I work and the way they work. My projects have tended to be a little bit of a demarcation between playing with strictly acoustic instruments in more of what you might call a jazz based environment, or I really like working with electric instruments in what you might call an expanded idea of rock, rock fusion, jazz fusion, psychedelia. They both allow me to work my style, my sax sound in ways that I think are exciting. I have had projects where I have got a chance to play with some great guitar players - Nels Cline, one of the greatest; Dennis Rea, a fantastic guitar player; Bill Horist - guys who really know how to work the electric guitar with me, and my current project right now is Quasi-Mojo with Bill Horist and Mark Ostrowski. I like working in tandem with drummers and I have put out a number of projects over the past couple of years of duos with drummers, one with drummer Dave Abramson called Good Curse, and then I have a recent LP out, a drum duo with Paul Kikuchi called Aurora Distillations that was a site recording done in an abandoned train tunnel up in a mountain pass in Washington State known for its sonic deep reverb. I like doing that, I like playing with the sax/drums. I think that is kind of the basic essential free jazz lineup, in my estimation, and then working with bass players, pianists, and other acoustic instruments. PSF: Where do you see yourself going as an artist over the next few years? WS: I see great things happening. I practice daily. I feel like I am as excited as ever about playing music. I hope that I stay in real good health and motivated to grow as a player and also expand my notions of where improvised music can continue to take me. I started playing in the mid to late seventies with no particular career agenda or even notion of where it might take me but I intuited that if I stayed true to it and kept growing as a player and developed my skills and refused to get jaded or cynical, that this music would take me to very vital creative spaces with vital creative people. It has done that and I just hope that it will continue to do that and I am going to do everything in my power to make sure it does. PSF: Are you satisfied with where you are now? WS: I am. That doesn't mean that I am totally satisfied because I don't think an artist can ever be totally satisfied, but I am very pleased with the quality of work that I am doing and the quality of the people that I am playing with and the quality of the experiences that I am being part of. Of course, one always hopes that unforeseen things are on the horizon that could further one's inspiration or one's depth of expression, or whatever the word �growth" means, but I am quite satisfied.